While Lane failed to make landfall on the islands, this did not lessen the storm's impact on the state. 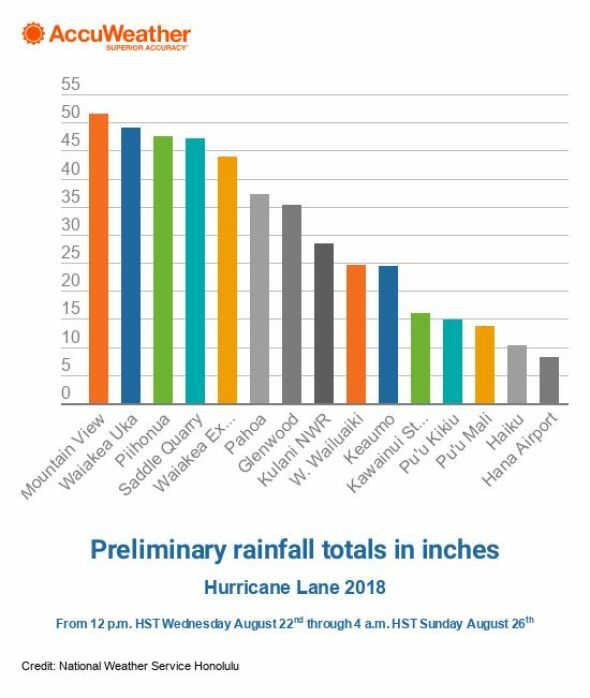 Preliminary rainfall totals of 2-4 feet were reported across the windward side of the Big Island with two locations recording even higher amounts. As of Sunday morning, local time, Mountain View has received the most rainfall with a preliminary total of 51.53 inches. 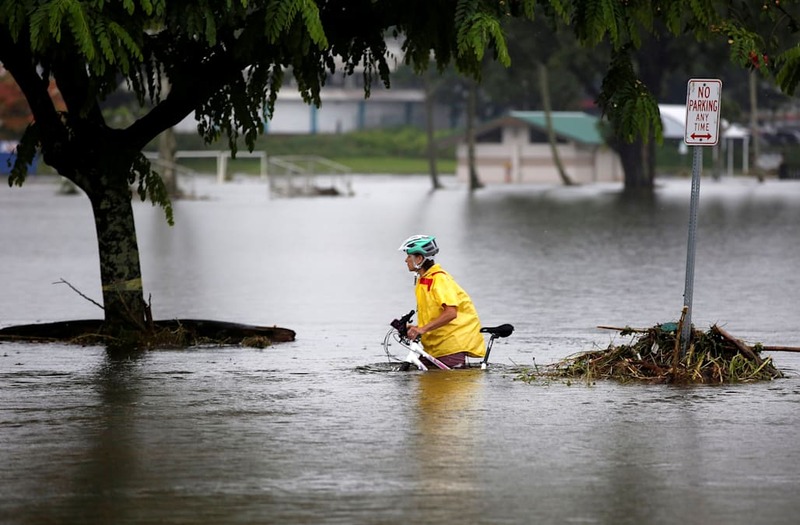 That ranks as the third-highest rain total from a tropical cyclone in the United States since 1950. Nederland, Texas, holds the record with the 60.58 inches that fell during Hurricane Harvey in 2017. The most rain from a tropical cyclone in Hawaii's recorded history is 52.00 inches from Hurricane Hiki in August 1950. Rainfall totals are expected to further increase, as additional downpours are in store into Monday. Hilo Airport observed its wettest four-day period on record from Wednesday, Aug. 22, to Saturday, Aug. 25, as 36.76 inches fell. Aug. 24 also marked the fifth-wettest calendar day on record with 15.00 inches. Eastern portions of Maui were also hit hard, with 1-2 feet of rain in some locations. Lane's slow-moving nature and the area's mountainous terrain contributed to the extreme rainfall amounts, which triggered landslides, evacuations and road closures due to high water. Nearly 40 people were rescued from floodwaters on Friday and Saturday in the eastern part of the Big Island, according to the Associated Press. One part of Haiku neighborhood in Maui was inaccessible after heavy rain damaged a road on Friday, according to Hawaii News Now. While Lane will be remembered most for flooding rainfall, gusty winds also caused problems. Prior to rain arriving, Lane's winds fanned two fires on the island of Maui on Friday. More than 100 homes were forced to evacuate in Lahaina as a fire rapidly spread early Friday, according to Hawaii News Now. Twenty-two structures were destroyed by the flames. A second fire broke out in Kaanapali and scorched 800 acres before fire crews gained the upper hand. Over 14,000 customers were left without power on Maui and the Big Island at the height of the storm, mostly from trees falling on power lines. Power has been restored to most residents. Prior to Lane's impact on Hawaii, AccuWeather President and Founder Dr. Joel N. Myers said that the storm could "be the single-costliest hurricane in recorded history of Hawaii" and "potentially cause in excess of $10 billion in damage." Hurricane Iniki caused just over $3 billion in damage to Hawaii in September 1992, which would be about $5 billion in today's dollars, according to Myers.